Cast: Kimura Takuya, Kitagawa Keiko, Sugimoto Tetta, Hamada Gaku and Masana Bokuzo. Kuryu Kohei (Kimura Takuya) has returned to the Josai branch after once again being transferred. This time the office has gotten new prosecutors and new paralegals except two familiar faces. As always Kohei does his usual by causing turmoil in the office, be it his clothes or his way of investigating every case in detail. Finishing the (current) last of Kuryu Kohei’s story, the second season is better than all others I have watched. Not acting wise or not cast wise, but the overall story is better now if you ask me, and kind of has a better idea of what it’s like being in the office as a prosecutor - also in court. 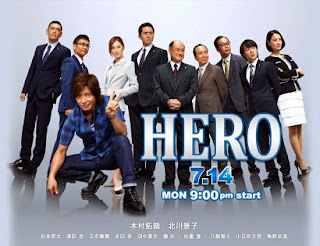 The thing that struck me both in the first season and the movie, which is also mentioned in season 2, is that the prosecutors are seen as bad in Japan: way different here where I live where the defense lawyers are seen as the bad guys. Kimura as always does his job as Kuryu flawlessly and having Keiko on the cast makes it even better. The rest are quite brilliant as well, which I have no objections to. All in all a great second season, and great cast.